The first Industry Advisory Board (IAB) meeting of the Post Graduate Programme in Human Resource Management (PGP-HRM) was held at IIM Indore Mumbai Campus Monday, July 23, 2018. 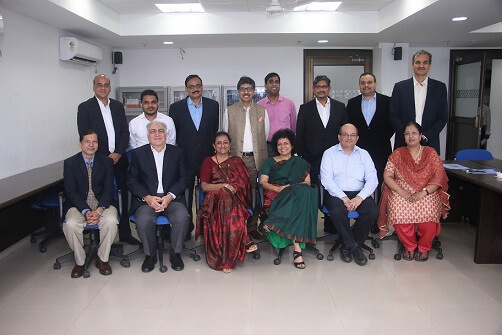 Several important thought leaders in the field of HR participated in the IAB as they deliberated on the vision that could drive PGP-HRM in making it a programme that responds to the contemporary needs of industry. Professor Rishikesha T. Krishnan, Director, IIM Indore welcome the HR leaders and invited them to share their thoughts to strengthen the offering to meet the contemporary needs of industry. The thought leaders reviewed the curriculum of PGP-HRM and provided a number of inputs to respond to the opportunities and challenges emerging from globalization, future of work, artificial intelligence and disruptive innovations. The deliberations centred on the capabilities that early career HR professionals will need to make a mark and deliver value to industry. The board reflected on the values and ethos that PGP-HRM could nurture among participants so that they could carry with them the ability to influence and bring a sense of curiosity and learning agility to organizations. The board also discussed how field practice could be integrated into the curriculum to enable participants to reflect on themes such as neuroscience enabled organisation development, behavioural economics, self and leadership development. The suggestions to enable participants to become career architects where they acquired a strong sense of appreciating competencies and assessment systems were also taken into consideration. The vision of the programme reflects a strong commitment in enabling participants to understand the myriad ways in which digital transformations are becoming a part of organizational worlds. HR practice is embracing digital technologies to structure systems where employees can be integrated more effectively into value creation platforms for organizations. Members felt that participants who had a comprehensive understanding of digital aspects of HR practice could add important value to organizations. Indian firms are beginning to globalize in important ways. In order for firms to achieve success in their globalization ventures, it will be important for them to acquire an immersed understanding of different cultures, regulatory frameworks and value systems. Members discussed ways in which PGP-HRM graduates could acquire inter-cultural competencies and a global outlook. The programme could become a building block where participants are able to understand the linkages between culture, law, business and value. Members proposed that the programme could develop the art of storying among participants to enable them to develop capacities of critical thought and effective communication. The IAB brought together a range of ideas that are core to the conceptualization of PGP-HRM. It reinforced the idea of PGP-HRM as a programme that aims to build a design that is not only to responsive to environmental transitions, but is also able to anticipate trends and build competencies around them. The IAB is a part of the institutional energy of PGP-HRM where professional practice constitutes an important part of the spirit of academic inquiry. The IAB operates in the spirit of dialogue where the attempt is to shape academic content that can orient participants to embrace a range of important values and competencies. It is a platform for reflection and the design of action that centres the programme around organizational and social imperatives of creating value.